Finding a job is rarely an accident. It requires hard work, a solid plan, and coaching from proven leaders in the field. Over the next four weeks, Brand Expert Latrice Collins will host a four part series that will provide tips and techniques for enhancing your job search strategy. This “Networking- Finding Leads” episode is the first in the series. 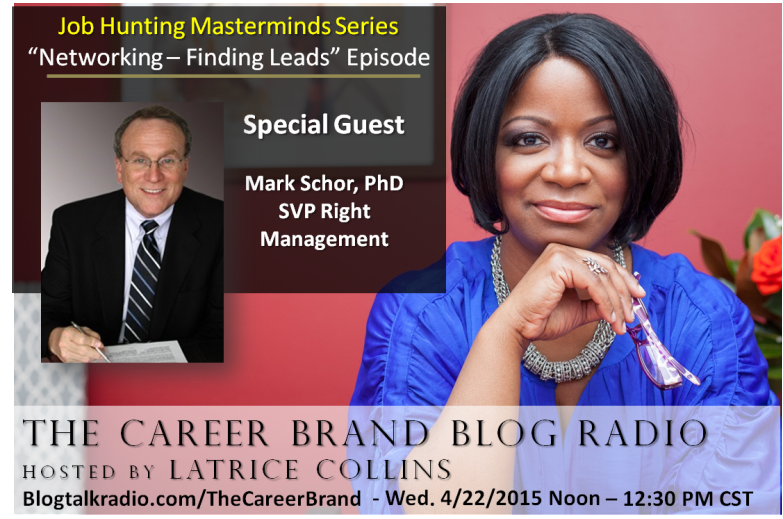 Our guest, Mark Schor, PhD, is the Senior Vice President with Right Management. (Right Management is a global leader in talent and career management workforce solutions within ManpowerGroup. Their clients include over 80% of the Fortune 500 and over 70% of the Fortune Global 500.) We are so excited to be able to have Mark on our show. in the near future, this series is just for you.